In July 2018, Carnegie's Scott Sheppard announced the discovery of 12 new moons orbiting Jupiter—11 “normal” outer moons, and one that he called an “oddball.” This brought Jupiter’s total number of known moons to a whopping 79—the most of any planet in our Solar System. Now you can help Sheppard and his co-discoverers select the names for five of these newly announced moons! Tweet your suggested moon name to @JupiterLunacy and tell us why you picked it using 280 characters or fewer or a short video. Don't forget to include the hashtag #NameJupitersMoons. - Jupiter Moons must be named after characters from Roman or Greek mythology who were either descendants or lovers of the god known as Jupiter (Roman) or Zeus (Greeks). - Submissions must be 16 characters of fewer, preferably one word. - Submissions must not be offensive in any language or to any culture. - Submissions must not be too similar to the existing names of any moons or asteroids. - Names of a purely or principally commercial nature are prohibited. - Names of individuals, places, or events that are principally known for political, military, or religious activities are not suitable. - Names commemorating living persons are not allowed. - S/2003 J5 (Jupiter LVII) which is retrograde and thus name must be related to Jupiter or Zeus and end in an “e." Further details about how the International Astronomical Union names astronomical objects can be found here. This video details some of the possible Jupiter moon names and can tell you more about how the Jupiter moon-naming process works. - Current Asteroid names can be checked at the International Astronomical Union's Minor Planet Center here or here. 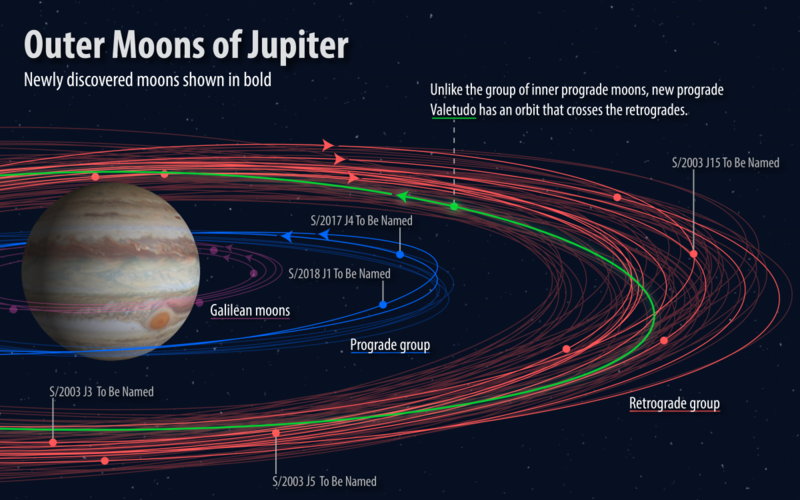 - Existing names for Jupiter's other moons can be checked at Sheppard's website here. Song by Marsha and the Positrons. Video by Emily Bank.